This all-inclusive resort boasts the ultimate entertainment in Cancun, including Vegas-style aerial acrobatics shows, DJs at poolside and Oasis Beach Club, live bands and musicians, themed parties and more. 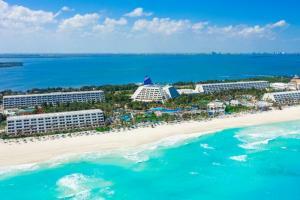 This resort also boasts Cancun's only casino in a resort, the full service Red Circus at Grand Oasis Cancun, open 24 hours. Dine at an impressive selection of restaurants serving a wide variety of international cuisines, sip cocktails and cervezas at trendy bars, lounge in the spectacular quarter-mile long swimming pool, or enjoy an opulent spa treatment. Located beachfront in Cancun’s Hotel Zone, just 18 minutes from Cancun International Airport and close to a wide variety of local attractions. AquaWorld Cancun, Museo Maya de Cancun, MUSA Underwater Museum, El Rey Ruins, Kukulcan Plaza Shopping Mall, La Isla Shopping Village, Xoximilco – Mexican floating fiesta, Xcaret Eco Theme Park, Ferry to Isla Mujeres, Ferry to Cozumel.